In the midday hours of March 15th, a time when many of New Zealand’s Muslim community paused for prayer at their local mosques, time seemed to stand still as all of the day’s colours turned to black, and then red. The details are now well known. By the end of it all, 50 lives of local Christchurch residents had ended, each and every one of them far, far too soon. As each hour and day passed, her example was inspiring. Inspiring much, sadly, because it was so unique in its unscripted, unfiltered, unwavering compassion, conviction, and action. Her inner compass seemed to pierce through all of the underlying noise, all of the tragic headlines, all of the bubbling plot lines. In so doing it guided her, without hesitation, without delay, without need for permission, in the absolutely right direction: towards her people, all people, with the Muslim community first. Where she went, what she wore, with whom she spoke, how she helped heal, day after day she made headlines. By standing with, she was standing out. Her strength was undeniable. Her example unquestionable. But what was it that, days after, continues to have has unique, style of leadership spotlighted, celebrated and desperately sought after. Her position was clear, her prayers clearly directed. Dressed in black headscarf the Prime Minister stood with mourners at Friday prayers just one week later, national television and radio stations carrying the deep, soothing, unifying sound of the azaan carrying across the nation. Swiftly, sincerely, patriotism changed, policies changed, NZ changed. And the coverage changed. Her genuine words, actions, spirit of unity and image dominated international media platforms and city icons. National symbols from the silver fern to the haka were reworked to honour the victims and show support of the wider Muslim community. Never, never before, has the western world seen such a standing up for the Muslim community. Insha’Allah, it is not the first and last. What is it about the power of what happened in Christchurch? How did the Muslim community, through it’s unbearable loss, find itself in a position of unbelievable unification of the global community? How could it be that one single act has caused such magnification of a willingness to understand, a desire to help heal, across one global community? Three little words suddenly set in motion, a spirit of change that has gone across New Zealand, and has rippled across the world. Three little words and it could have stopped there. In today’s day of soundbites, quick hashtag activism, it could have stopped there. But it didn’t. Seeing the Prime Minister Ardern immediately expressing her condolences was expected. What was unexpected was the way in which she bowed down to lay flowers – she did it with her head covered, her leadership taking on the colours and textures of tradition headscarves worn in times of mourning. And in covering her head, she showed an honouring and the respect of the people who were suffering – what they stood for, what they believed in, what held them together, their faith that ultimately came under attack. Those actions have rippled across the world in a most profound echo. The question is, for how long will the echo be heard? Almost two weeks on since that horrific day, as daily reports from NZ are replaced by dramatic daily event unfolding in ie. the UK as the Brexit clock ticks louder and louder, and other new global challenges emerge, how will this time, this turn of sentiment, be embedded? How will this new way of society looking at itself, looking out for its collective, no longer accepting the divides, endure? How, when the azaan – the Muslim call to prayer – is heard on the streets of Christchurch, of Auckland, of Sydney, of so many places across the world , will people respond. Will they pause and look up….or will they look away? 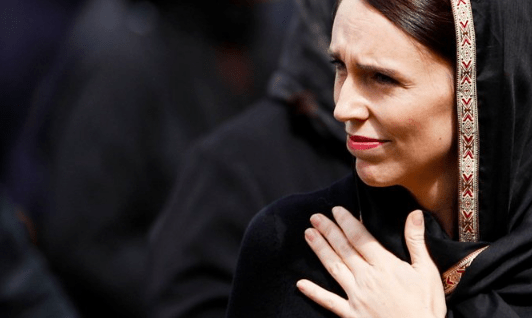 Much has been written about Prime Minister Ardern – ‘Jacindamania’ as many now call it. And hopefully, much more will. Why hopefully? Not because it is about her. Nor because it is about her tiny country that is a mere fraction of the size of many global nations shaping the globe in the future. It is because her tiny nation is showing how one small moment, one small place, three little words, can shift, in a more compassionate and connecting direction, the minds and hearts of the world.